Have you tried to fix your posture by strengthening and stretching muscles or by adjusting the spine or by consciously trying to correct your posture but you still have the same posture as before? And do you wonder why you can’t change your posture? Whether you're training movement for rehab or athletic performance, moving with "attention" and "intention" makes a huge difference in terms of motor learning. For example, doing an shoulder raise exercise with a weight or elastic tubing will help strengthen shoulder muscles as resistance and gravity place physiological demands on the muscles. However, strength gain may not carry over to actual functional tasks such as reaching arm overhead to put a dish on a top shelf, changing a light bulb, or any overhead throwing, which means there's no motor learning. Exercising just for the sake of strengthening or stretching muscles will not require much attention of the brain. There won't be much learning without the engagement of the brain. Adding an "intention" for movement/exercise will add a meaning and purpose to movement, and this will grab the brain's attention. Here are examples. When boxers do shadow boxing, they have clear intention of every movement, that is fighting against an imaginary person. During Aikido practice, an attacker has a clear intention when he/she is grabbing the opponent's wrist, that is to keep him/her from reaching for their weapon. This intention organizes the bodies to create movement. You wouldn't exercise for no reason, would you? You probably exercise to improve your functions. So, think about what specific function you're trying to improve with each exercise. Once you know that, you visualize a specific function while performing each movement. In order to make real improvements that will last for a long time we will need to change how we move. When we change how we move, we'll start to place demands on our bodies differently so we'll start to use muscles that we didn't used to, which then over time will become stronger and more flexible. When you move with intention, you will pay more attention to your movement, and your movement becomes much more purposeful and meaningful, which will make your exercise much more effective. Strength gain is given when you place demands on your bodies, but motor learning (changing movement habits) isn't without attention. Next time you work out or practice movements, think about what specific function you are trying to improve with each exercise and practice moving with attention and intention. Over the years I have come across situations where I taught my clients different movement patterns as a supposedly better alternative to their habitual movement patterns, somehow those new movement patterns never stuck to them. One day out of blue they started adapting and using the new movement patterns automatically. I always wondered why that might have occurred. I wondered if they didn't do their "homework," so they didn't adapt. One day I was playing with my 7 month old son. He could roll over pretty well, but couldn't still pull himself forward on the floor, so I put a few toys on the floor, thinking he would try to reach for them and maybe would pull himself forward. He didn't care enough to even attempt to reach. Then, he started crying because he was getting hungry. So I went to grab a bottle and he was staring at the bottle with such excitement. As soon as I put the bottle on the floor, he quickly rolled over and started pulling himself forward so desperately. He just learned army crawl! Just like his father, he LOVES FOOD. Food is very important for him, more than anything it seems. Food draws 100% of his nervous system's attention. His nervous system organizes movement patterns to allow him to accomplish his goal, that is to get to food and eat. That's made me think about my clients who adapt to new patterns fast and those who don't. I think this has a lot to do with whether those movement patterns are perceived as meaningful and salient by the nervous system. When I say nervous system, I'm talking about what's happening at subconscious level. I think this is why changing habits is so difficult as it requires a shift at subconscious level, or very strong will power. And, this is why it's so important to think about functional contexts and meaning around particular movements you're practicing, not just repeating the same movement mindlessly. I truly believe in a holistic health/wellness approach. Healthy eating habits, healthy sleeping habits, healthy exercise habits, and healthy social life. I think it's all about balance. Too much of good food or too much exercise can be a bad thing, just as too little of those things can be a bad thing as well. You can't be healthy physically if your mind is not healthy. There is an old Japanese saying: "Yamaiwa kikara," meaning illness starts in the mind. I've started to understand what this means from a physiological standpoint. I often see people who eat just healthy food and avoid eating any "bad" food, and exercise regularly yet they often get sick. One thing I've noticed that those people tend to have a lot of stress in their life (work, family, etc). There's autonomic nervous system which consists of parasympathetic nervous system and sympathetic nervous system. When we're stressed, parasympathetic nervous system slows down and sympathetic nervous system becomes more active. So they have a yin and yang relationship. When that happens, our digestive system slows down, heart rate and breathing rate go up, immune system slows down. The nervous system is now in "fight/flight" mode. This physiological response prepares us for emergency situations. During those situations, digesting food isn't a priority. Mobilizing muscles so we can fight or flight is a priority. This is a very good thing. However, when someone is chronically stressed, there's a serious problem. Now autonomic nervous system is out of balance. Immune system and digestive system become suppressed. When someone is in this state, no matter how well he/she eats, he/she can't get much nutrition out of food. And, they're much more prone to illnesses due to suppressed immune system. Changes in physical state often reflect changes in psychological state. In Aikido, they say physical body is an extension of mental state. When our body and mind are out of balance and start to act separately, then we start to develop all sorts of problems. This is why I believe in a holistic health/wellness approach. Mindful movement practice such as Feldenkrais, Tai Chi, Aikido, Yoga, etc is a wonderful way to keep our body and mind in balance. If you or someone you know are dealing with chronic pain, please read this blog post and share it with other people. I've worked with and know many people with chronic pain and their quality of life is negatively affected by pain. Most of them have tried many things (pain meds, injections, chiro, acupuncture, PT, massage, Yoga, you name it). Each helped to a certain degree but only for a short period of time. None resolved their pain. They were given so many different diagnoses by different health care professionals. Each time they saw a new healthcare provider, they were given a new diagnosis, and they became more confused about what's going on and they gradually became fearful of movement as they were afraid of causing more damage. They were in a vicious pain cycle. This scenario is actually very common in people with chronic pain. Unfortunately, not all healthcare providers have a good understanding of current pain science. Since there's a plenty of great resources available, I will not go into details about pain science. A short video below helps you understand pain. Why is it important to understand pain? One of the most common misconception about pain is that pain = tissue damage, and pain is telling our brain that there's a damage. However, this is not true. The brain produces pain only when it perceives a threat to the system regardless of tissue damage. This is why phantom pain, perceptions that an individual experiences related to a limb or organ that is not physically part of the body, exists. In people with chronic pain, their nervous system has become so sensitive that it can perceive even normal stimuli as a threat, thus produce pain easily. Their pain experience is due to sensitive nervous system, not tissue damage. In order to get them out of pain cycle, they first need to understand the mechanism of pain. As long as they still believe that pain = tissue damage, the nervous system continues to stay sensitive and react to movement easily by producing pain. Knowledge is a very powerful therapy that can rewire the brain. When cognition and understanding about pain change, the nervous system starts to become less sensitized and will not perceive normal stimuli as a threat. Movement is absolutely necessary for recovery, but as long as the brain still perceives movement as a threat, you will continue to experience pain. This is very important for me as a movement educator/therapist. Many clients are dealing with chronic pain, thus, I am very careful about how I use my words as words can influence their cognition/beliefs, which can have either positive or negative effects on the nervous system. For example, if I frequently use negative words like "broken," "weak," "torn," "out of alignment," etc, then they become more anxious, worried, fearful, and confused, which is perceived as a threat by the nervous system. The result: PAIN! The opposite is also true. I certainly try to use words to help my clients get out of the vicious cycle of pain. Now imagine yourself on a peaceful beach, relaxing and enjoying a drink. Next imagine yourself being chased by a police car for whatever reasons. Have you noticed any changes in muscle tone and breathing? Imagining actions involves the brain activities which will produce physiological changes such as changes in heart rate, breathing, muscle tone, etc. Try this: Close your eyes and imagine moving your right big toe up and down without actually moving your big toe. Notice whether you moved your eyes toward your right big toe. Even though you didn't move your right big toe, your brain planned a motor action the same was it would to actually move it. In a way, imagining to doing movements is not that much different from actually doing the movements as far as brain activities are concerned. The power of imagination has practical applications. People with chronic pain typically have sensitized nervous system, which means it has a lower threshold for pain, and more easily produce pain. In those people, pain is often associated with movement. The brain can produce pain experience regardless of any actual tissue damage, which is commonly the case for people with chronic pain. In fact, in more serious cases just imagining to do certain movements associated with pain can actually produce pain even without any movements. However, imagining to do those movements can be used therapeutically to desensitize the nervous system and start to dissociate pain with those particular movements. Over time as the nervous system becomes less sensitized, a pain threshold will increase, allowing them to move more. This is one strategy used to get people out of chronic pain cycle. Very useful. The power of imagination is also helpful to improve physical skills. In fact, many performance artists, martial artists, and athletes utilize this strategy. I also use this strategy quite often to practice Aikido or sports. It's also used in the Feldenkrais Method to enhance learning. From my own experience, I must tell you that it really works. It's sometimes more effective than actually doing movements. Next time you practice some skills, try doing whatever movements you're practicing just in your imagination. See if it helps you learn faster. Our brain has "maps" that represent parts of our body for movement and sensation. These brain maps are constantly updated when we move our bodies. The parts that tend to be used more frequently have a larger representation on the brain maps. Maps are also unique for each individual. For example, pianists have much larger representation of fingers than most people. Likewise the parts that are not often used have smaller representation. So what does that mean? It means that movement clarifies brain maps. Updated and accurate body maps mean good kinesthetic awareness. The body parts that have smaller representation on the maps tend to have less clear sensation. It's hard to feel/sense those parts. How clearly can you sense your low back one vertebrae by one vertebrae vs individual fingers, with your eyes closed? For most people, sensation on low back is not that clear. Our brain relies on these maps for movement. If your brain maps are outdated and inaccurate, what you're actually doing may be very different from what you think you're doing. Every time I have my clients notice such mismatch between actuality and their thought, they are so amazed. Most people cannot feel/sense the shape of their spine accurately. Sometimes they sense the opposite of what they are actually doing. For example, when I ask people whether their lumbar spine is arched or rounded, they tell me that it's rounded when it's actually arched. Try this: "Close your eyes and raise your shoulders out to side to shoulder height so your arms are parallel to the floor. Open your eyes to confirm whether your perception was accurate or not." This is why I focus on improving client's kinesthetic awareness so movement becomes more precise. Don't you want to have an accurate road map or updated GPS when you go on a road trip?? In both Awareness Through Movement classes and one-on on movement re-education sessions, I draw your attention to various parts of your body while you're engaged in movements. This process clarifies your body maps so actuality and what you're doing become much much closer. As Moshe Feldenkrais said, "If you know what you're doing, you can do what you want." What is Self-Image? One of the main objectives in Feldenkrais Method is to improve one's self-image/awareness. Moshe Feldenkrais said "we act in accordance with our self-image, which consists of sensing, feeling, thinking, and moving." He thought these 4 aspects of self-image are interrelated, and a change in one aspect would influence the other 3. He believed that it's necessary to improve self-image/awareness in order to improve human functioning, and the easiest way to do that is by working with movement. Changes in movement can be easily observed unlike emotion, thought, or sensation. You'll be asked to observe all 4 aspects of self-image while you're guided through a sequence of movements in Feldenkrais lessons. During this process, you will discover your habits and how movement habits and emotional/intellectual habits are closely related, and when you discover new movement patterns, you will also discover how that will influence your feeling, sensing, and thinking. You will eventually experience how mind and body are really inseparable. They are the two sides of the same coin. I grew up in Japan where a holistic approach is quite common. Although western medicine is more common now there, eastern medicine is still practiced. The idea of mind-body connection is very old. Yoga, Tai Chi, Zen, Judo, Aikido, and many more share the same idea. I always believed in this idea, but it was just the idea in my mind as it wasn't tangible. In a way, mind and body were still separate because it was just the idea (mind) and missing physical experience (body) for me. After my first experience with Feldenkrais Awareness Through Movement class, this idea immediately became real as it provided me kinesthetic experience of such relationship. Trying to understand and appreciate this relationship without kinesthetic experience is like trying to learn how to ride a bicycle just by reading instructions or listening to someone's instructions without actually riding it. I have noticed that many people including myself have hard time moving slowly when we exercise. I so often have to remind my clients to slow their movement down many times. I must admit that I had very very hard time to do that. It took me a long time to learn that. I used to hate walking because it was too slow and boring. I used to prefer running to walking. In the last few years I've learned the benefits of moving more slowly. When we move fast, we access movement patterns that have been used many times, called habitual movement patterns. We use the sub-conscious part of our brain, which responds very fast. This is useful when we have to move quickly during emergency situations. However, when we're learning new movement patterns, we have to rely on different parts of our brain, conscious part of the brain, which acts much more slowly. In order to allow us to access this part of the brain, we need to move much much more slowly. If we move slowly, we won't bypass our sub-conscious part of the brain and inhibit habitual patterns. This is one of the key principles in my movement re-education. When someone keeps hurting because of their habitual movement patterns, they need to learn how to move differently. If they try to move fast when learning to move in a different way, their habitual movement patterns keep interfering. This is why it's a common practice for Tai Chi and Feldenkrais Method to move very slowly so they can pay attention to how they are moving and they can adjust their movements continuously. I must tell you that this practice has completely changed the way I move and the way I work with my clients. I've learned so much about how I move and definitely improved my movement quality. By the way, the same mechanism applies to thinking, feeling, and sensing. How we emotionally or intellectually react works much like our movements. To break your habits, you'll need to SLOW DOWN. Click HERE for the description of the method by Feldenkrais.com. 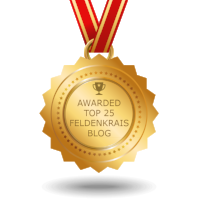 You probably still have no idea what Feldenkrais Method is about after reading the description. Let me share my experience. About 6 years ago I was getting a bit frustrated at work as patients kept returning to us for similar problems (e.g., shoulder impingement, low back pain, neck pain, patello-femoral knee syndrome, etc). I thought we did a pretty good job of teaching our patients about how to strengthen/stretch some muscles to solve their problems, yet they returned to us after a year maybe 2 years. I thought I "fixed" the problems by strengthening weak muscles and stretching tight muscles to restore their imbalance, but they apparently didn't get "fixed." This observation made me very curious as to what's really the root of their problems. Upon my research I found Feldenkrais Method several times. The first time I saw the name, I didn't pay much attention. After having seen the name several times, I had to do more research about it. I read his books and read some articles, but I still didn't know what it was. The only thing I knew was it had something to do with changing habits. I thought habitual way of moving/using ourselves was the root of many problems my patients had. One day I saw a weekend Feldenkrais Awareness Through Movement workshop, and I decided to attend to experience it for myself. My first experience was "Wow!! I don't feel pain anywhere in my body!!" I always had some pain but I was so used to having pain that I forgot I had pain until my pain was gone. I felt much taller and my body felt so much lighter and felt as if the gravity decreased. The effect after my very first Awareness Through Movement lesson was so profound. During the lesson I discovered how one body part connected to another body part and how they could work together to decrease stress on one part and distribute it to the whole body. As a result, it felt so much easier to move. I also discovered my movement habits, which of course I wasn't aware of until then. My movement habits just like the majority of other people were such that I wasn't distributing work very well throughout my whole body. At this moment I knew I found what I have been searching for. This really allows us to discover the root of many problems (physical as well as psychological) we may be having and also discover new options so we don't get stuck in our habits. Habits are useful as long as you know they are. However, habits can sometimes create problems when we are not aware of them. As Moshe Feldenkrais (the creator of Feldenkrais Method) said, "if you know what you are doing, you can do what you want." Effort is generally encouraged in our culture. No pain no gain mindset is still prevalent in health/fitness industry. More effort doesn't necessarily result in more gains when it comes to rehab. The reason for this is that trying harder will only exaggerate your habitual movement patterns. If habitual movement patterns are contributing to repetitive stress injuries because of lack of movement variability, then increasing effort by increasing resistance or speed probably won't solve their problem(s). Instead, when you reduce effort, you'll have a much better chance of improving in your movement ability as less effort allows the nervous system to recognize patterns of movement and learn more efficient movements. This is why Feldenkrais Method, Tai Chi, Aikido all emphasize reduction of effort. One of my clients who recently had a cataract surgery told me that one thing that she noticed immediately after the surgery was that her hearing improved dramatically. She didn’t really realize that her hearing was affected by her vision until she had the surgery. Her story reminded me of how much we rely on our vision to interpret verbal contexts. I can relate this to my own experience as a foreigner. I’ve been in the States for 18 years and speak English fluently, but even now I sometimes have difficult time with phone conversations because I can’t see their body language or facial expression. My grandmother was excellent at communicating with the body language. She couldn't speak English at all, but she always made friends and seemed to have very good conversations without speaking at all. From neuroscience, I understand the parts of the brain communicate with each other. This story is one example. This makes me wonder how smart phone/computer is influencing our non-verbal communication skills and the brain's functions and development. Texting is becoming a very common communication method today. It's convenient and can save us a lot of time, but it can easily deliver wrong message.